It’s the summer of 1917, and the United States has now joined World War I. Overseas, black men are fighting for their country. At home, black men are still being lynched. Waco (where, in 1916, Jesse Washington suffered a similar fate in front of 15-20,000 people). When will such violence end? Why is the law not protecting black citizens? 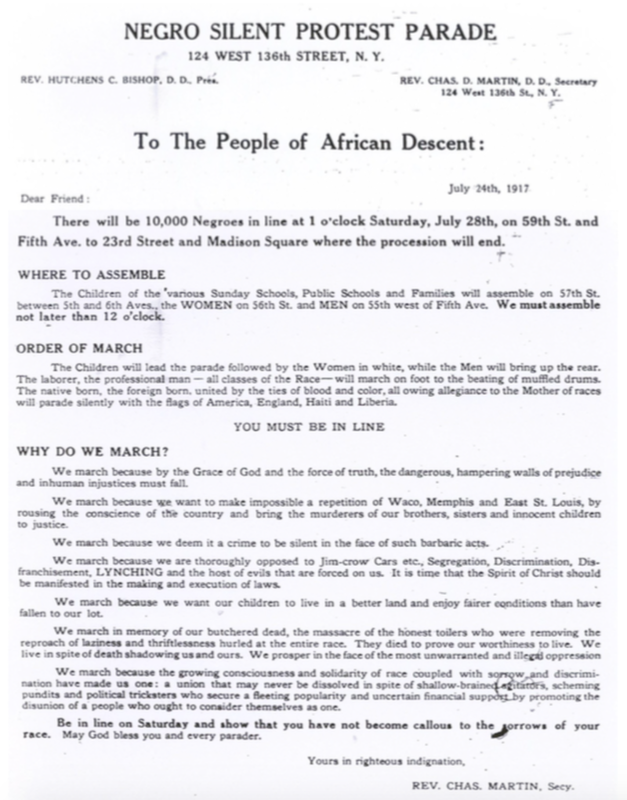 The NAACP organizes a protest march to take place in New York City. It will be a march marked by silence. Its participants will wear white. Their footsteps will be accompanied by the sound of muffled drums. We march because we want to make impossible a repetition of Waco, Memphis and East St. Louis, by rousing the conscience of the country and bring the murderers of our brothers, sisters and innocent children to justice. We march because we are thoroughly opposed to Jim-crow Cars etc., Segregation, Discrimination, Disfranchisement, LYNCHING and the host of evils that are forced on us. It is time that the Spirit of Christ should be manifested in the making and execution of laws. We march because we want our children to live in a better land and enjoy fairer conditions than have fallen to our lost. We march in memory of our butchered dead, the massacre of the honest toilers who were removing the reproach of laziness and thriftlessness hurled at the entire race. They died to prove our worthiness to live. We live in spite of death shadowing us and ours. We prosper in the face of the most unwarranted and illegal oppression. We march because the growing consciousness and solidarity of race coupled with sorrow and discrimination have made us one: a union that may never be dissolved in spite of shallow-brained agitators, scheming pundits and political tricksters who secure a fleeting popularity and uncertain financial support by promoting the disunion of a people who ought to consider themselves as one. America has lynched without trial 2,867 Negroes in 31 years and not a single murderer has suffered. We hold these truths to be self-evident that all men are created equal. That they are endowed by their Creator with certain unalienable rights. That among those are LIFE, LIBERTY and the pursuit of HAPPINESS. If you are of African descent tear off this corner. Photo by Underwood & Underwood, taken on 28 July 1917. Copyright, to Underwood & Underwood, now expired. Public Domain photo. Maintained by the Library of Congress; LC-DIG-ds-00894 (digital file from original item) LC-USZ62-33789 (b&w film copy neg.). Bos, Carole "Silent Parade of 1917" AwesomeStories.com. Jul 28, 2017. Apr 24, 2019.